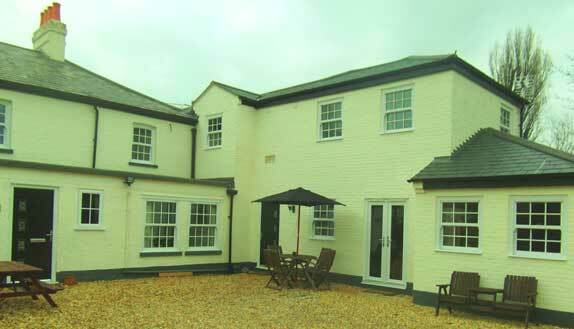 The Whitehouse lies in the village of Great Paxton, just a short distance from the historic market town of St Neots. It provides a unique opportunity to enjoy a luxurious country break in the glorious Cambridgeshire countryside. The Whitehouse is the ideal retreat, offering guests the opportunity to relax and unwind in this beautiful setting whilst still enjoying an excellent central location to St Neots, Huntingdon, Cambridge and London. Whether your visit is for business or pleasure you will always find a warm and friendly welcome and great food, whether your visit is for one night or a short break. Guests can self cater or evening meals can be ordered (at an extra cost). Goods links to A1, A14 and all major motorways. Visit Britain has now awarded the Whitehouse a 4 star grading for guest accommodation. The Whitehouse Guesthouse is an ideal location to accommodate your wedding party - many brides have left the Whitehouse on that exciting trip to the church. We are local to the famous Papworth hospital where we welcome relatives and friends of patients and we can ensure their stay is as stress free as possible at such difficult times we will do our utmost to support with plenty of tea, cakes and hugs if needed.